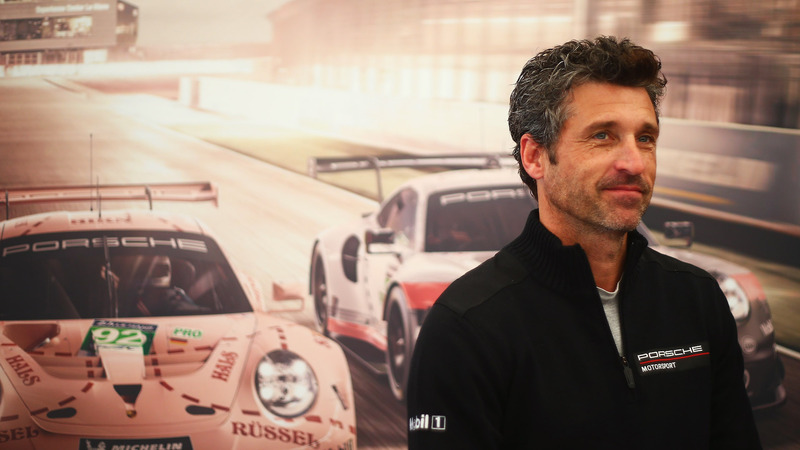 Patrick Dempsey may not have his hands full with Grey's Anatomy duties these days, but that doesn't mean he's idling around. In fact, he's busier than ever because he is currently devoting time to his other big love these days: car racing. While Dempsey has been a major fan of the sport for more than a decade, a new interview with Men’s Journal reveals that — following a hiatus of a few years — he’s ready for life back in the fast lane. “I can’t wait to get back behind the wheel of one again,” Dempsey told Men’s Journal, referencing an all-electric Jaguar I-Type 2 race car at the Qatar Airways Race Track in Brooklyn. As part of his brand ambassador role with luxury Swiss watch brand Tag Heuer, Dempsey was asked to take the sleek vehicle for a solo run prior to the season’s final race for Formula E.
Dempsey, who admits to hitting speeds of over 200 mph on the track, also opened up about his favorite car. And, well, his pick will tug at your nostalgic heartstrings. “I have a 1963 Porsche 356 that gives me an emotional experience every single time. I bought it over 30 years ago, after I did Can’t Buy Me Love. I was drawn to the silhouette. It was one of those dream cars that I always wanted. It is one of those rare classic cars that you can drive. That is a very special car to me, because at the time, it stood for what I had achieved, but also where I wanted to go as far as driving. I am getting here,” he said. Dempsey is clearly a man smitten. But he explains that his passion for the sport isn’t unmerited — it has changed him in profound ways. Dempsey was in danger of losing that feeling with his wife, Jillian, when she filed for divorce from her husband of then-15 years in 2015. However, Dempsey managed to save his marriage in part by scaling his motorsports involvement way back. "Our union has to be the priority," he told People after the pair reconciled. Dempsey’s recommitment to his racing craft suggests that the actor has found a way to reconcile his love for cars with the actual love of his life. And the way he tells it, being behind the wheel makes him a better man across the board. "You feel present, in the moment, which is the challenge for us all," he mused, "and how I want to spend my days."